The second day at the Rally of Coimbatore was predictable in some ways, while also being a day of tremendous upsets in other respects. Predictable, because Gaurav Gill and Musa Sherif took their third victory of three rallies in the SUVNRC class, with the SuperXUVs of Sunny Sidhu and Lohitt Urs following them home in second and third place. 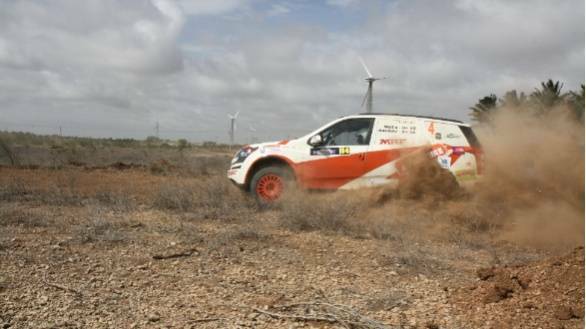 While Amittrajit Ghosh and Ashwin Naik took their third win of three rallies in the INRC category, finishing ahead of Vikram Devadasan and Srikanth GM, Phalguna Urs and Anoop Kumar DS came third. However, there were some surprises that lurked in the other classes of the rally. The clear favourites in the IRC category  Samir Thapar and Vivek Ponnusamy in their Mitsubishi Evo X  ended up crashing out of the rally on SS6. Given that Thapar held the lead in the IRC category and was running second overall, it certainly was a shame that he ended up having to relinquish an almost in-the-bag win. But Thapar had been pushing his car hard, determined to catch up with Gaurav Gill and challenge him to the title of fastest car of the rally. However, the stages had changed overnight, becoming a lot rougher than they had been on Saturday, something that eventually ended up doing the JCT team in. This handed the win in the IRC class to Karamjit Singh and Jagdev Singh, who, after claiming victory at the Rally of Maharashtra, now have two wins of their first two rallies in Indian National Rally Championship (INRC). Also while Arjun Rao Aroor and Satish Rajagopal looked set to take the win in the 1600cc category, they ended up losing to Byram Godrej and Prajwal Pai. Aroor was slowed down when the car (of Dr Bikku Babu and George Verghese) ahead of him flipped, due to which he was shown yellow flags and asked to slow down. Of course, Aroor still managed to bag second place in his category, ahead of Mohammed Kasim A and Sanath G.
Victory in the JINRC category went to Asad Khan and Zayne Asrar, who had won their class at the Rally of Maharashtra as well. Victors from the South India rally - Suhem MK and Jeevarathinam J - ended up taking second place in the category. Rohan Pawar and Arjun Mehta finished third. The INRC now has a long break before the final two rallies of the season - the K1000 in September and the Rally of Chikmagalur in December.